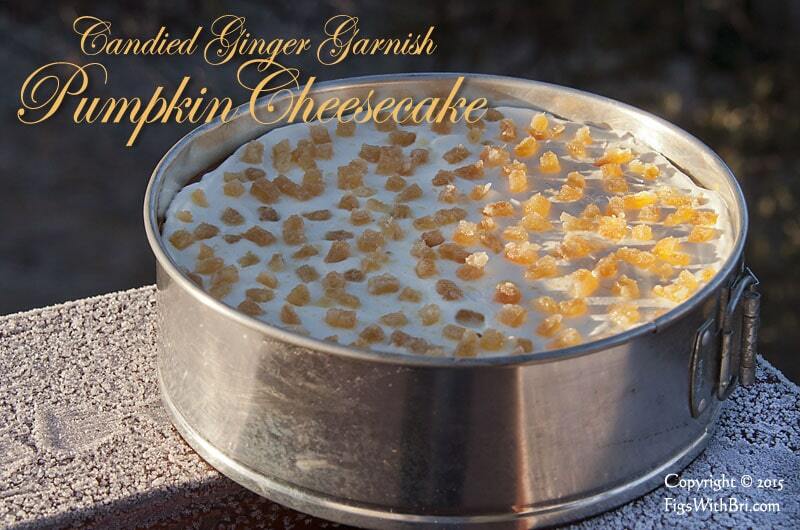 Crystallized Ginger garnished Pumpkin Cheesecake sparkles like the frost on our deck railings. The winter holiday season has arrived! Just past Thanksgiving in the USA, now families are planning menus for Hanukkah, Christmas, and Kwanzaa…including favorite seasonal desserts, of course. Made TWO desserts for Thanksgiving: Our favorite Streusel-topped Pumpkin Pie which I like to make from fresh pumpkin (or heirloom pie squash) purchased at our local farm market (and then roasted in my oven). Plus another lovely, easy-to-make, open faced pie, our delicious Rustic Apple Tart. Pumpkin pies don’t require much puree. Leaving plenty of left-over puree, even from a smallish pumpkin, to use in either savory (curries, soups, sauces, stews, herbed muffins, etc.) or sweet recipes (puddings, cakes, tea breads, etc.). Excellent in all! A more unusual way to use the puree is in this extraordinary, gorgeous, delicious Pumpkin Cheesecake. Resistance is Futile! The party table and pumpkin cheesecake await our guests. 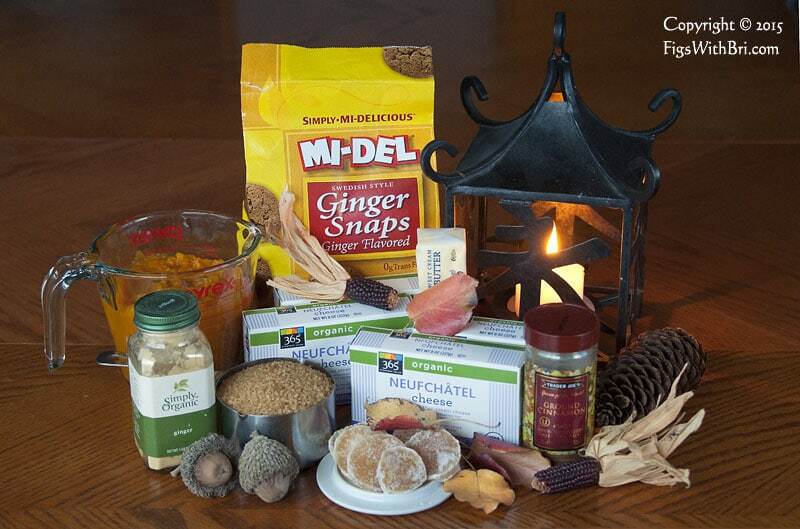 Ingredients for a delicately spiced (cinnamon & ginger) autumn pumpkin cheesecake. 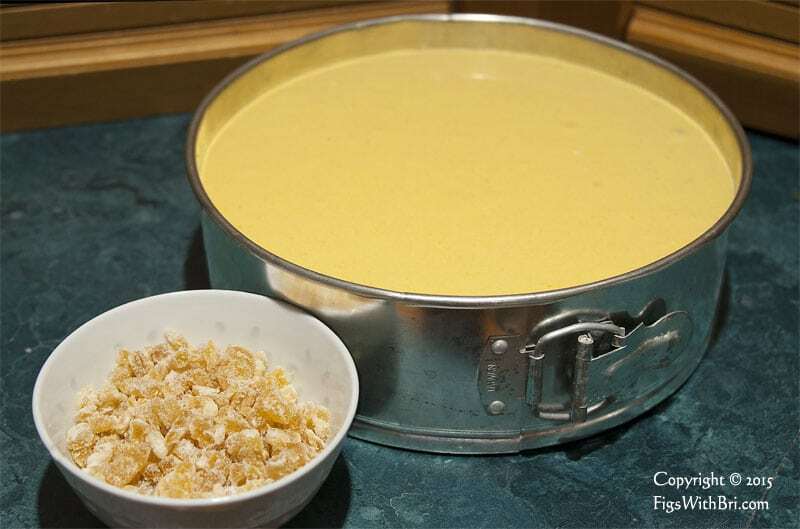 • In a bowl, combine cookie crumbs and melted butter, mix well until moistened. • Press the crumbs evenly into the bottom and a bit up the sides of a 9” springform pan. • Using an electric mixer, beat the cream cheese, sugar, and salt until smooth. Add the egg replacers, one at a time. Mix well after each addition. Stir in the ginger, cinnamon and pumpkin puree. • Pour the pumpkin batter over the cookie crust. Smooth with a rubber spatula or the back of a large spoon. The pumpkin cheesecake’s ready to bake. 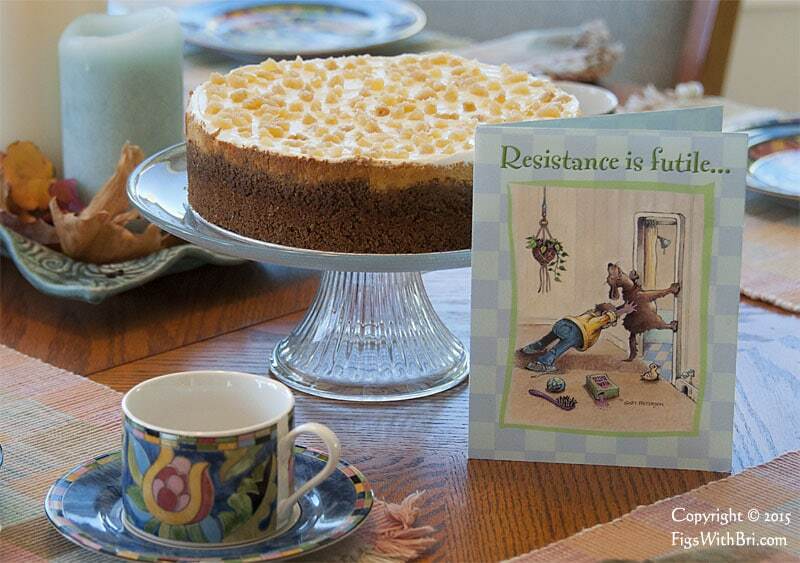 Crystallized ginger has been diced to use as a garnish once the cheesecake has cooled. • Bake in a preheated 375F oven 25-30 minutes. Turn off heat, leave in for another hour without opening the door. • Remove from oven and cool to room temperature. • Chill in refrigerator for at least six hours. Let the pumpkin cheesecake cool to room temperature, before refrigerating it overnight. • Spread sour cream evenly over top of cooled cheese cake. • Garnish with a sprinkling of ground cinnamon or finely chopped candied ginger. 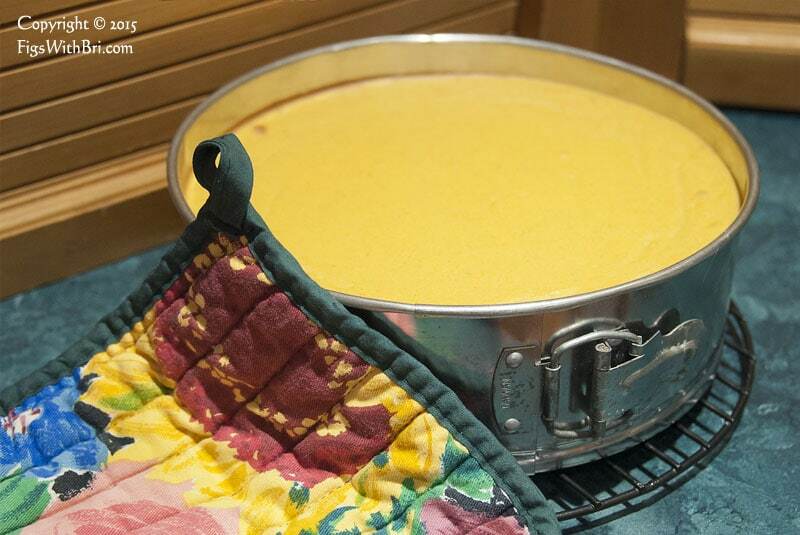 • Unmold cheesecake by running a knife around the inside edge of springform pan and then releasing the latch. • Cut, serve & enjoy! 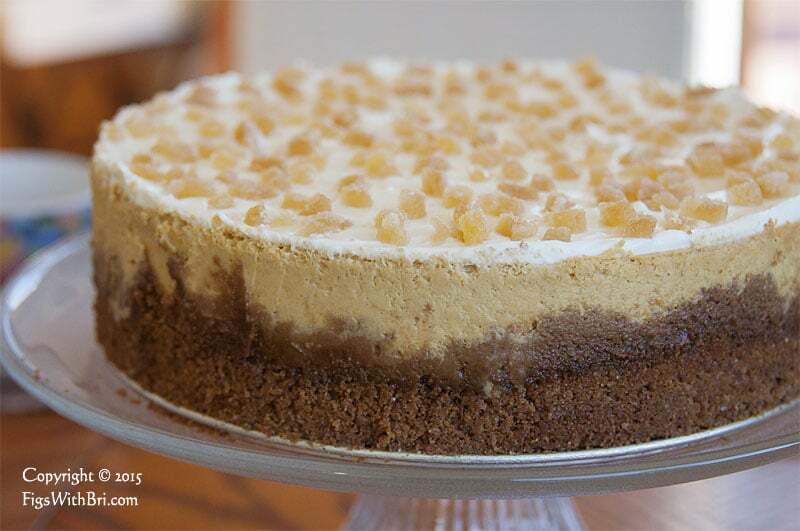 This Pumpkin Cheesecake with a candied ginger garnish will WOW family and friends! 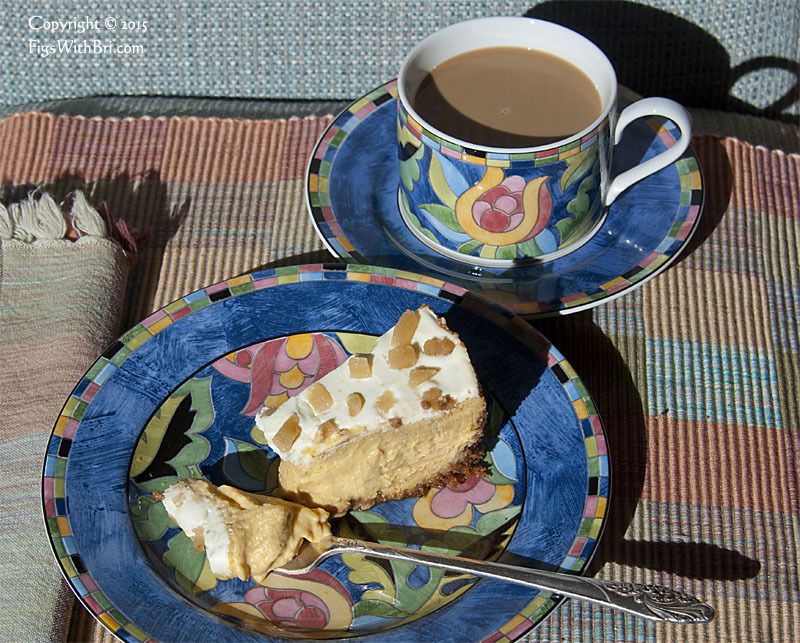 We savored every bite of this indulgent Pumpkin Cheesecake treat! This truly looks fabulous. Hope at some time to get it together and try to make it. It appears that a special cake tin is needed. Thanks for ‘stopping by’ Michael! The cake tin is a standard 9-inch springform pan. May be purchased on-line…I bought a set of three different sizes years ago. Now that I have a cheesecake audience, I can finally put them to use. Hi! Margot ~ It IS amazing! Was a great success with our party guests who ate generous slices along with seconds!